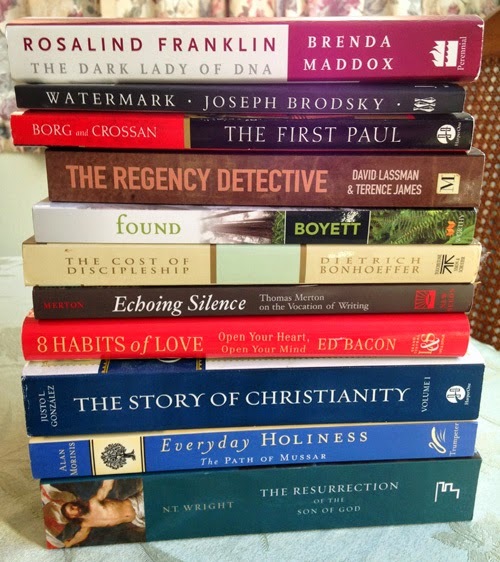 Rachel Held Evans recently posted a list of summer reading, which was a bit like last year's actually -- but given that I have books on my to-read list including a couple that I bought based on her list last year, I shouldn't be surprised. Anyway, these I haven't read (except the first which I've almost finished reading), so these are not recommendations, just what's on my list to read this summer. and the very next book I'm going to read once I'm done with the biography on Rosalind Franklin, The Resurrection of the Son of God by N.T. Wright, which I bought because I read his Simply Jesus (written as Tom Wright, that's how you know it's written for a layperson) because I think he skimmed on this -- also a fair chance that he hadn't written this volume when he wrote that. I also have some fiction in another stack: Elizabeth Bear (fantasy author who is so amazing I buy her stuff in hardback) and Scott Lynch's newest Locke Lamora (fantasy, also bought in hardback) and others of that ilk. Wait!!! You left off the one I recommend and it is a MUST READ. I promise!!! That's "Iscariot: A Novel of Judas" by Tosca Lee. Trust me, it's a great read.